Q is for. . .
Running along this hillside is the San Andreas Fault. 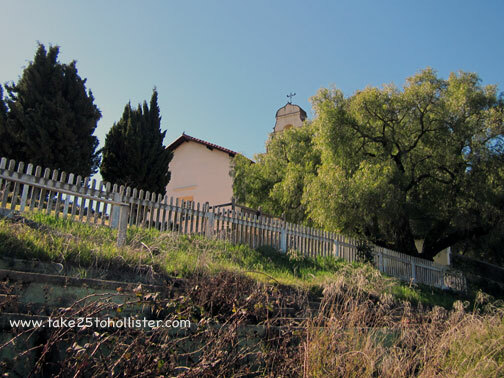 This is below Mission San Juan Bautista, about seven miles east of Hollister. What did the San Andreas Fault say to the Calaveras Fault? 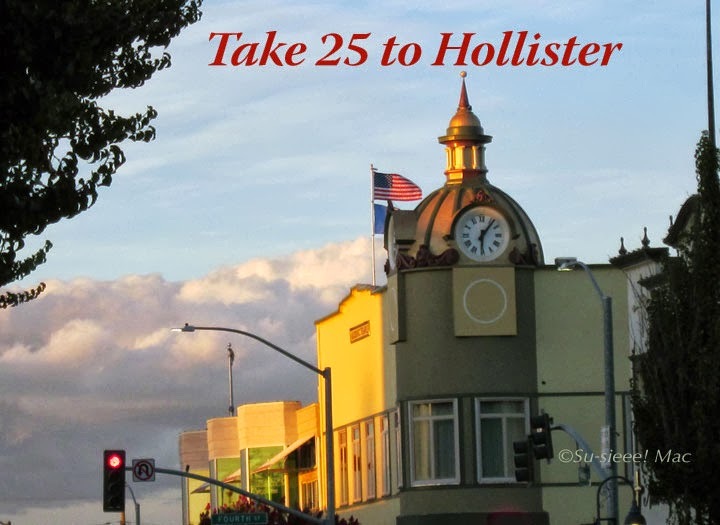 Hollister is smack in the middle of earthquake country. It sits on and near two active faults that do their shaking thing nearly every day. Someone told me that we have earthquakes every day, but most are so slight you can't feel them. I don't get concerned until the house starts rocking or I see the trees rolling during an earthquake wave. The infamous San Andreas Fault runs about nine miles southwest of the Hollister. Geologists say you can see evidence of it as you head up Cienega Road to the wineries and Hollister Hills State Vehicular Recreation Area. This fault also runs behind Mission San Juan Bautista, about seven miles west of Hollister. The Calaveras Fault, a major branch of the San Andreas Fault, starts somewhere south of Hollister and actually runs through town. You can especially see it at Dunne Park between Sixth and Seventh Streets. This bend was caused by the Calaveras Fault. It's on Sixth Street across from Dunne Park. 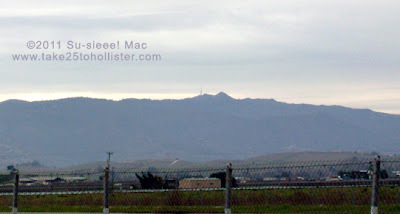 What caused Park Hill to stick up above Hollister's valley floor? Have you ever wondered about that? The Calaveras Fault skirts along the western base of the hill, so maybe it was pushed up by tectonic activity over millions of year. That's one theory of geologists. Another theory is that Vista Hill somehow escaped being eroded away by whatever it was that wore down the terrain into a valley. 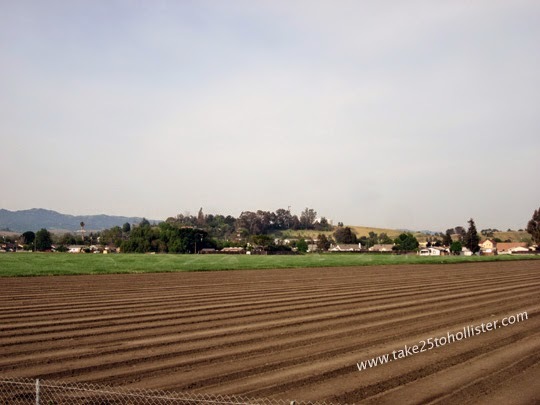 If you're interested in reading more the Calaveras Fault in Hollister, check out this page at Geology Cafe.com: Calaveras Fault in Hollister, CA. 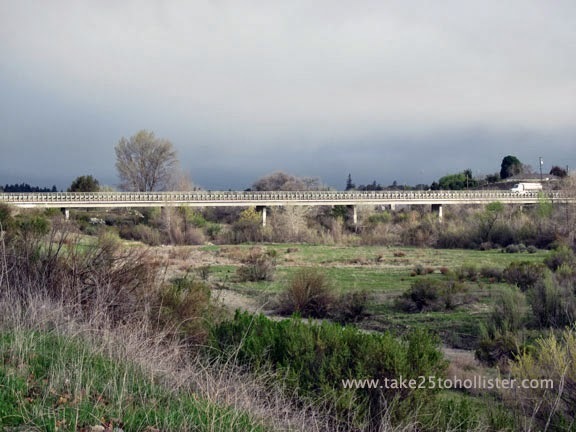 I had no idea until this morning that the Union Road Bridge stands over a Calaveras Fault strand. However, according to this geologist at Geology Cafe.com, "There is no direct evidence of the fault in the river bed. . . ." I guess that's good to know. in Hollister is due to the Calaveras Fault. Last week (or was it this week? 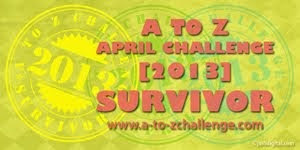 ), we felt a couple of good grumbles in the earth, measuring in the low 3's on the Richter scale. That's nothing when you're used to it. Nerve-wracking, if you're not. 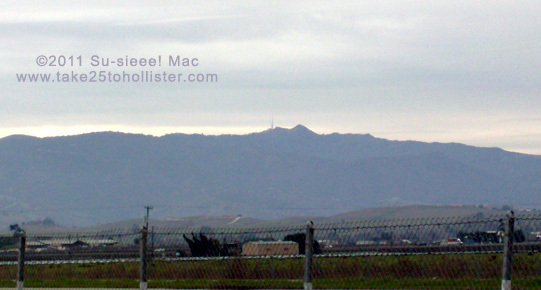 But, it is to expected when you live in Hollister. . .or Tres Pinos. . .or San Juan Bautista. . . or anywhere in San Benito County. Yup. We have two major earthquake faults cutting through the county. 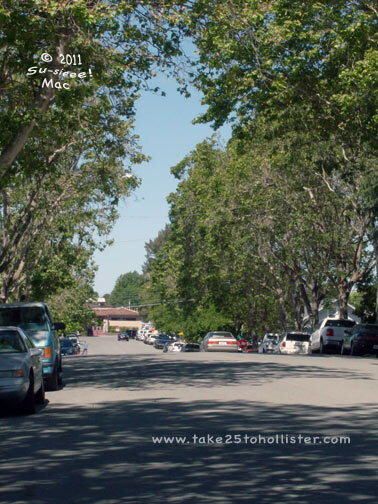 The Calaveras Fault runs right through downtown Hollister, while the San Andreas Fault circumvents Hollister to the southeast and winds itself through San Juan Bautista just below the mission. Earthquakes happen nearly everyday in our county. Mostly micro ones, which is good, as they release much needed tension. Just like burps. Up there on the cliff is Mission San Juan Bautista. 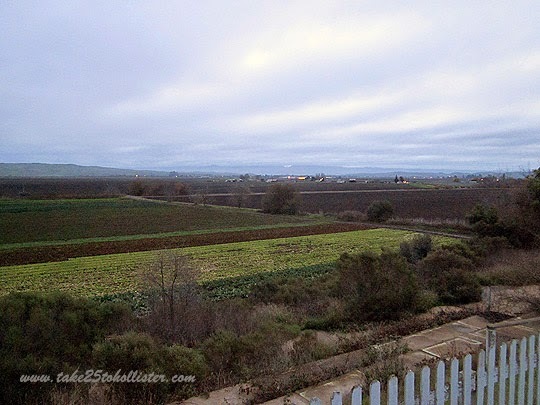 I took this photo from the original El Camino Real, which ran from Mission San Diego to Mission Sonoma. If I understood what I read, several feet below where I stood runs the San Andreas Fault. I am amazed that the mission has stayed up all these 200 years. Do you see what looks like green benches below the fence? I was told that they are remnants of the bleachers for the once-upon-a-time annual San Juan Bautista Rodeo. Earthquake! just now. It felt like one of those rolling waves. I'd say a 4.8. We shall see. But, that's not what today's photo is about. Nope. Yesterday, the husband and I drove over to Bolado Park to deliver my entry fee for the upcoming San Benito County Fair. Alas, the office was closed. We wandered the grounds a bit to see if someone was still around. Nope. 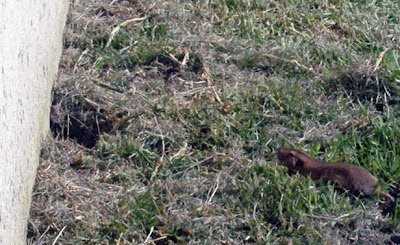 Just gophers. The one who went into the hole seconds before I took the photo was bigger than this guy. I wonder how gophers handle earthquakes. crosses the street, I do believe. Want to learn more about the Calaveras Fault up close? 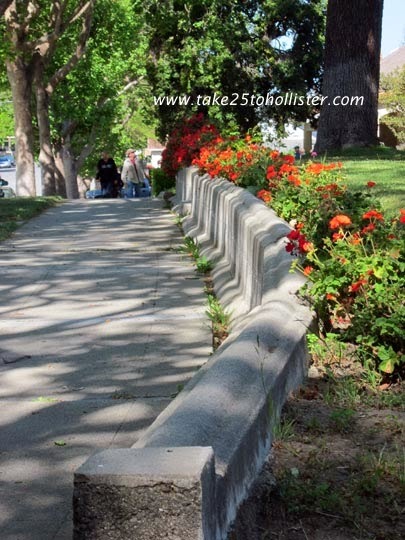 This Saturday morning, April 16, geologists from Pacific Geotechnical Engineering will lead a walk tracing the fault through downtown Hollister. The one-hour walk starts at 9 a.m. at the San Benito County Chamber of Commerce office at 650 San Benito Street. The walk is free. For more information, call the Chamber at (831) 637-5315.